The dogged and relentless police chief of Far Woods is a badger, his cockeyed sidekick assistant is a cat who thinks he’s a badger (he’s actually an adopted badger), the victim’s a rabbit, the litigious lawyers are owls, the violent predatory suspects are a wolf and a coyote, and so on. Characters sip mothitos (get you tipsy) and nom on beetles (unless they’re holding white flags), porcini mushrooms (taste like meat), and other non-animal victuals and keep a law that keeps them from eating each other. All that peace ends when Rabbit is murdered, his blood-spattered fur and bones found testifying to a violent end in someone’s stomach. Can they discover who killed Rabbit and gnawed his bones clean? all for you, you, you! 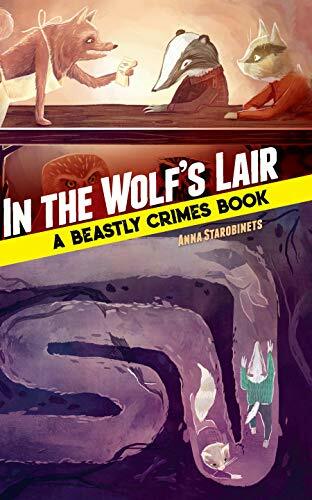 The mystery wraps up satisfactorily and there’s a lead-in to the next story as In the Wolf’s Lair is first in a series by the author, Anna Starobinets. Highly recommended for fans of Tim Burton, twisted fairy tales, and very quirky mysteries. Life in the Far Woods tends to be tranquil because the animal denizens are strictly forbidden to kill (or eat!) one another. An elderly detective, Chief Badger, oversees the community and solves its petty crimes, from stolen pine cones to plucked tail feathers. His restless assistant, Badgercat, longs for some excitement — a desperate crime, a beastly crime! The brash youngster’s hopes are realized when some croaking frogs reveal the shocking news of Rabbit’s murder. Wolf appears to be the most likely culprit, because — duh — he’s a lone wolf without an alibi, but Badger refuses to jump to conclusions. With the help of Vulture the crime scene investigator, Mouse the psychologist, brave witness Beetlebug Buck, and other curious creatures, the woodland detectives set out to discover the truth. Newly translated from the original Russian, this fancifully illustrated volume is the first of a Beastly Crimes Books to come from this imaginative mystery series geared toward middle-grade readers. Look for the sequel, A Predator’s Rights, also available from Dover Publications.